ANM and Medical Officer, Pediatrician posts on contractual basis. Selection for these posts will be based marks in academic qualifications and walk in interview. There are total 43 vacancies available in this CDMO Bhadrak District recruitment. Eligible candidates may apply in a prescribed format before 27-Dec-2017. 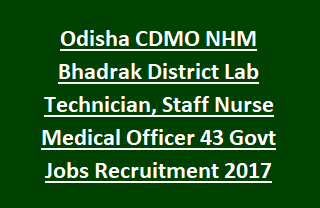 For more information regarding this CDMO NHM Bhadrak District paramedical jobs please see the information below. There are total 43 posts available in Odisha Bhadrak District Health Department. Age limit are 21-32 years for SC/ST/SEBC candidates 5 years and for PH/Ex-Serviceman 10 years of age relaxation will be given. Selection will be held based on marks secured in Academic Qualifications. Eligible candidates can send their application form along withal necessary educational qualifications, community certificate and other required documents. For more information please see the official notification. Office of The Chief District Medical Officer , Bhadrak.